I generally feel most lost when I am in a crowd of people. That’s not because I’m particularly introverted, and I’m definitely not shy. But I, like most people, have demons, and my greatest demon is my tendency to compare myself to others. When I’m in a crowd where people are telling stories or talking about their latest home improvement projects or sharing recipes, my immediate reaction is to think they are so much accomplished or more social or more interesting than I am. That’s my demon. But the angels who save me are people like Oscar Wilde. 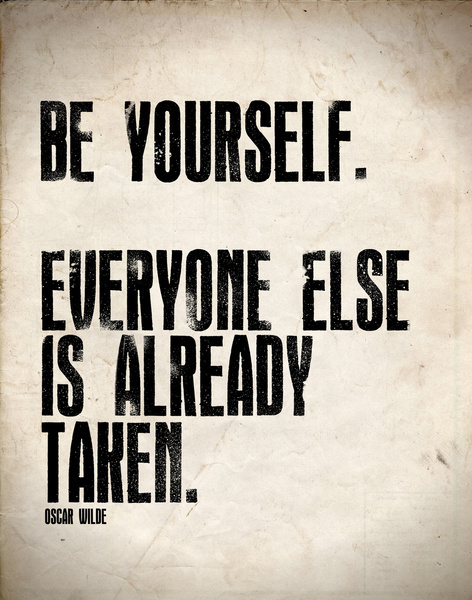 His famous quote “Be yourself. Everyone else is already taken.” reminds me that the only thing I should expect to perfect is being myself. Posted on December 3, 2013, in Family, My life, perspective and tagged 365 reasons to smile, confidence, musings, Oscar Wilde, self worth, smiles, Thoughts. Bookmark the permalink. 40 Comments.